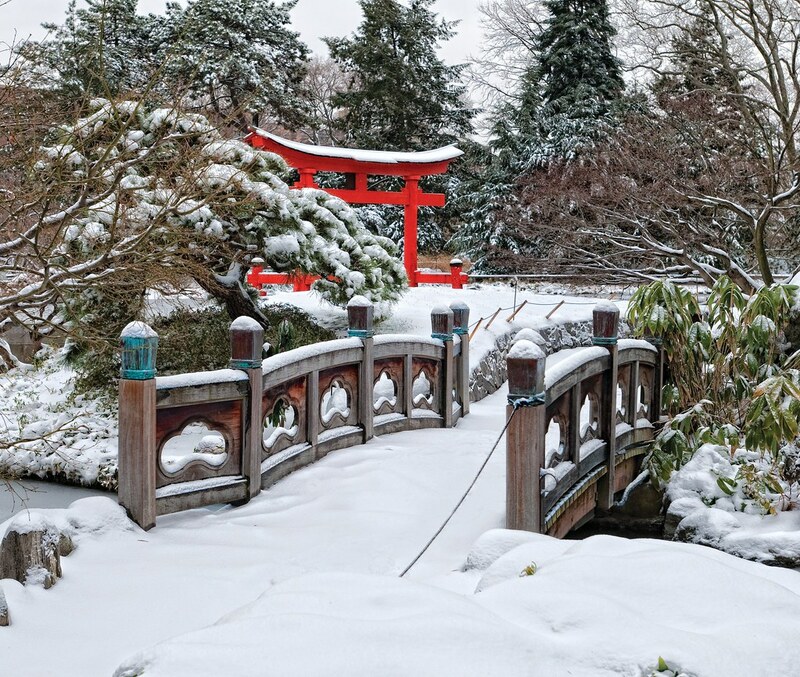 Opened in 1915, Brooklyn Botanic Garden's Japanese Hill-and-Pond Garden is one of the oldest extant Japanese-inspired gardens in the United States and the first to be built in a public botanic garden. More than a century later, it remains a testament to Americans’ enduring appreciation of Japanese gardens. The garden is a modeled after a traditional Japanese stroll garden, but elements of other historical styles have been incorporated into it. It was designed to be both viewed from a distance and explored on foot. Upon entering the pavilion from the formal entrance, you first experience the garden as a vista, composed as a painter would compose a painting. To the left is a dramatic vermilion-colored wooden torii, a traditional gate signifying that a Shinto shrine lies beyond. It emerges from the pond against a background of gently rounded hills and a wooded path. To the right, an arched bridge leads to a small grassy island, where a Japanese black pine has been pruned to look windblown and contorted with age. This idealized landscape was created in the Japanese tradition of shizen—the art of making a garden look as though it has grown that way on its own. Other vistas are gradually revealed as you walk along the garden’s winding paths, including a five-tiered waterfall that you hear before you see as you round a bend. Farther on, a small rustic Shinto shrine sits on a steep hill. Japanese style was very much in vogue when the garden’s creator, Takeo Shiota, came to the United States from Japan in 1907. Japanese gardens had been exhibited in several recent world’s fairs to popular acclaim, and they were being installed in museums and chic hotels as well as on the private estates of wealthy Americans. Shiota—who had resisted traditional apprenticeship and acquired his design sense by trekking alone on foot to study the Japanese landscape—had designed several residential gardens in the New York area by the time he was hired by Brooklyn Botanic Garden to design a garden for its developing site, in 1914. Philanthropist Alfred T. White donated the relatively modest sum of $13,000 for the project, and Shiota set to work with a crew of laborers and horse-powered equipment. At the center of the garden was a 1½-acre pond, a remnant of the brief period when the site had been a park. Its winding, asymmetrical shape ensured that it could never be viewed in its entirety, so that the viewer must walk to see it from different perspectives. Water flows into the pond on its western shore via Shiota’s statuesque waterfall. Instead of the traditional rounded stones usually used in Japanese water features, it is composed of shelves of jagged Manhattan schist. The result was said by some to resemble an Italian grotto, and it is possible that the Italian workers assisting Shiota influenced its design, which also includes echo chambers to amplify the sound of falling water. Shiota contoured the land around the pond into a series of steep hills and planted Japanese maples and flowering cherries along the shore, adding pines and other conifers around the pond. Japanese plants were rare in the United States at that time, so Shiota used a mix of Asian and native species in his design. When it opened in 1915, Shiota’s finished garden was well received and enjoyed great popularity until just before World War II. 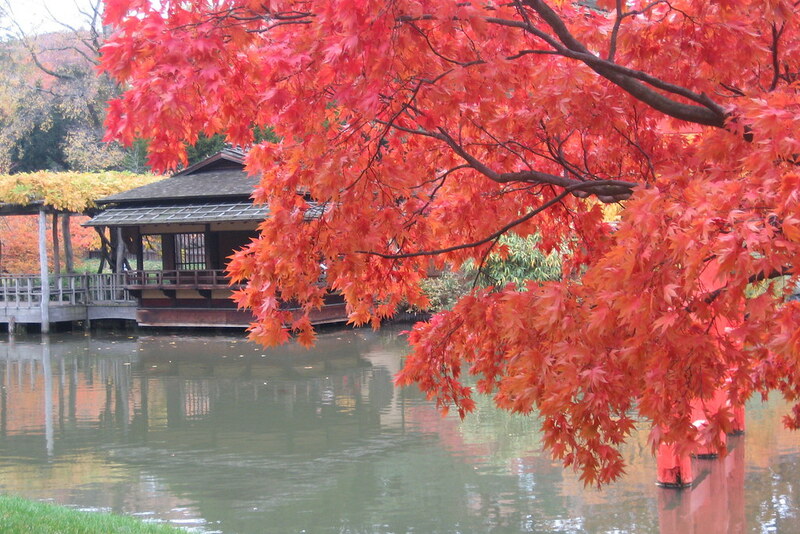 In 1938 its shrine was burned down, and the garden was closed for a time due to public antipathy to Japan. After the war, Japanese-American gardener Frank Okamura was hired to care for the garden. During his long tenure, he restored the garden, including the shrine, and helped develop BBG’s world-renowned bonsai collection. In 1999, a $3 million restoration championed by BBG president Judith Zuk helped return the garden to Shiota’s original vision. An enormous buildup of silt was removed from the pond, and the shoreline was renovated to prevent erosion. Taking over just as the infrastructure work was being completed, curator Brian Funk was able to select new plants for the garden, with an eye toward creating more authentic Japanese plantings over time. Even as the plantings evolve, they reflect the Japanese goal of four-season interest, achieved through color and structure. The delicate Japanese maples are beautiful year-round, especially when their foliage turns brilliant shades of red and gold in the fall. Curator Funk, who studied gardening techniques in Japan, says that fully half of his work in the garden is pruning. Azaleas and other evergreen shrubs are shaped into gentle domes to provide important structure year-round. Since the trees and shrubs have been carefully pruned, they hold snow, expanding the garden’s seasonal appeal. 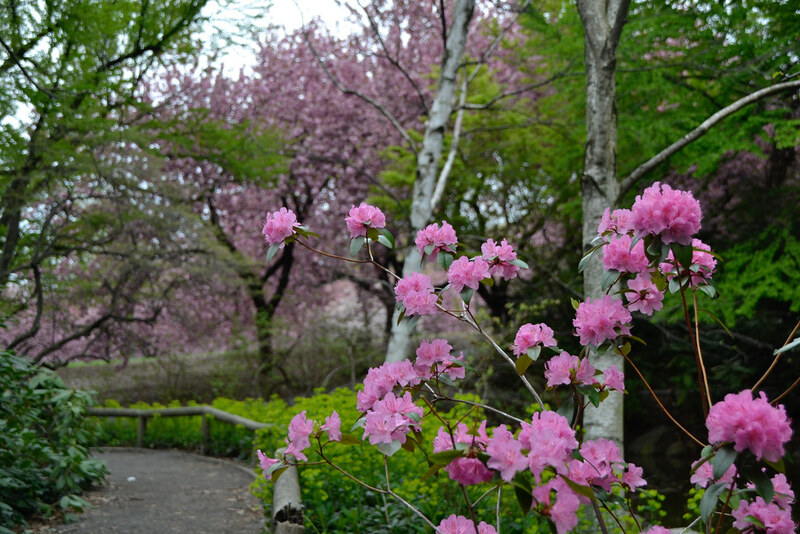 Every spring, all of New York City eagerly awaits Brooklyn Botanic Garden’s first cherry blossoms—usually those of Prunus ‘Fudan-zakura’ and P. subhirtella ‘Pendula’ on the shore of the pond. To celebrate hanami, the tradition of viewing cherry blossoms, visitors flock to the Garden over the next month as the rest of its famous collection of ornamental cherries blooms in the Japanese Hill-and-Pond Garden and the adjacent Cherry Esplanade and Cherry Walk. Each tree may be in bloom for only a week, but the sequence occurs over five weeks, and many people return frequently to catch the whole show. The season culminates with Sakura Matsuri, a two-day festival to celebrate traditional and contemporary Japanese culture that attracts upwards of 70,000 people. This beloved rite of spring is a fitting way to introduce Shiota’s garden to visitors and entice them to return over and over to delight in nature in the heart of the city. This article is taken from BBG's 2015 handbook, Japanese-Style Gardens. Wish I could share the smile the blossoms put on the face of my 100-year-old Aunt Edna’s face, when we visited BBG last week! It looks like a little part of Japan was brought to make its beauty shine on U.S soil. 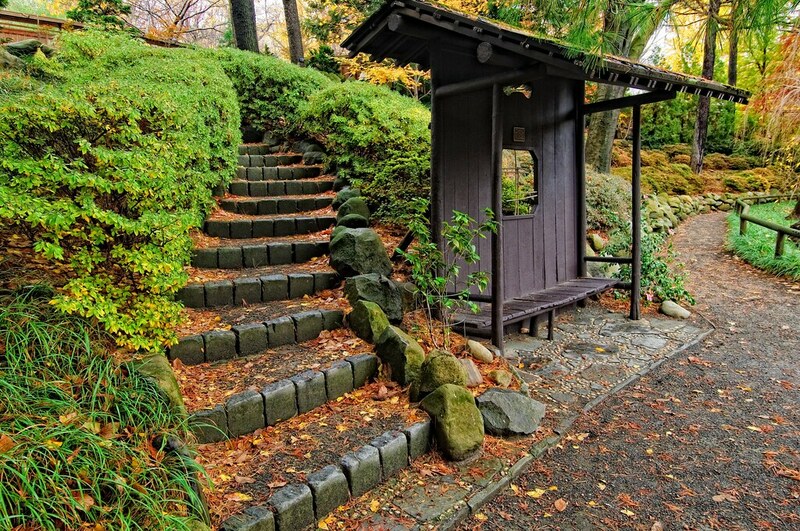 A covered waiting bench sits at the base of the steps leading to the Shinto shrine. Photo by Antonio M. Rosario. The Japanese Hill-and Pond Garden in January. Photo by Antonio M. Rosario. Azalea sp. 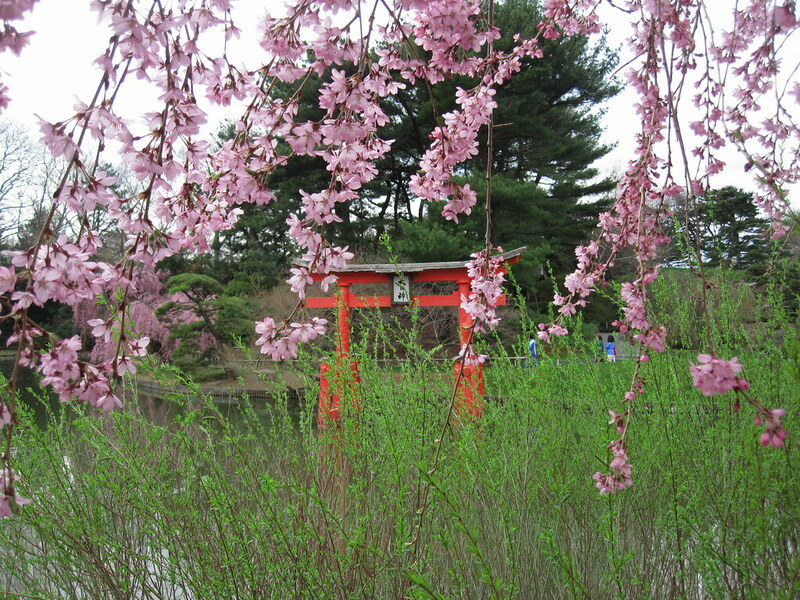 blooming in the Japanese Hill-and-Pond Garden. Photo by Blanca Begert.